Hotel complex from the 1960s. In the 1960s a German property developer, Karl Kurt Vorlop, built a hotel complex with over 1,000 beds to take advantage of the naturally occurring thermal springs and the source, which provides the water for Valser mineral water, sold throughout Switzerland. After the developer went bankrupt, the village of Vals bought up the five hotels in the development in 1983 and resolved to commission a hydrotherapy centre at the centre of the five hotels, at the source of the thermal springs. In 2012 the hotel and spa, previously owned by the Vals community, was sold to the investor Remo Stoffel. 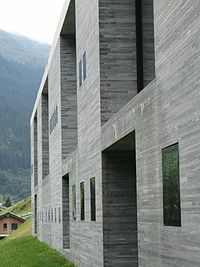 Peter Zumthor was selected as the architect for the spa, despite his limited track record at the time. The facility was built between 1993-1996. The baths were designed to look as if they pre-dated the hotel complex, as if they were a form of cave or quarry-like structure. This is particularly evident from observing the grass roof structure of the baths, which resemble the foundations of an archaeological site, and reveal the form of the various bath rooms which lie below, half buried into the hill-side. Built using locally quarried Valser quartzite slabs, the spa building is made up of 15 different table-like units, 5 metres in height, with cantilevered concrete roof units supported by tie-beams. These units fit together like a giant jigsaw puzzle. The nature of the construction is revealed through close inspection of the roof – the roofs of the units don’t join, with the 8 cm gaps covered by glass to prevent water ingress. Inside, this provides a dichotomy – the concrete makes the roof appear heavy, but the gaps between the units also make the roof appear to float. Detail of masonry, and exterior wall. There are 60,000 one meter long sections of stone forming the cladding of the walls. Whilst these initially appear random, like an ashlar wall, there is a regular order. The cladding stones are of three different heights, but the total of the three is always 15 cm, so it allows for variety in arrangement, whilst facilitating construction. The architect intended to not include clocks within the spa, as he believed that time should be suspended whilst enjoying the baths, but three months after the baths opened, the architect relented to pressure from the client by the mounting of two small clocks atop brass posts. The music video for the song "Every Time" by American singer Janet Jackson from her album, The Velvet Rope (1997), was filmed in the then-new Therme Vals. The novel "Tout ce qui remue et qui vit" (2013) by Swiss Writer Isaac Pante takes place in the Therme Vals. French photographer Dominique Issermann spent three days with French model and actress Laetitia Casta. The result of this photoshoot is available in a book published by Éditions Xavier Barral. Wikimedia Commons has media related to Therme Vals. This page was last edited on 27 October 2018, at 20:39 (UTC).